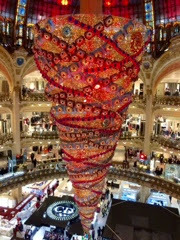 The inverted Christmas tree at Galeries Lafayette Haussmann is sensational! And the glass cupola reflects the changing light moods of the tree. You get a different perspective of the Christmas tree from the upper galleries and a great view of the golden legs that reach up to the cupola. Pink monsters dance behind display windows to the delight of the children. They flocked to see the decorated Christmas themed windows as their parents excitedly took their pictures with the monsters. I couldn't get a full view because there were so many people milling around. So I had to make do with a side view. It's a Joyeux Noël indeed in Paris. Through January 4, 2015.